529. In which periodical exams did the student obtain the highest percentage increase in marks over the previous periodical exams ? 530. The total number of marks obtained in Feb. 02 is what percent of the total marks obtained in April 01 ? 531. What is the percentage of marks obtained by the student in the periodical exams of August, 01 and Oct, 01 taken together ? 532. What are the average marks obtained by the student in all the periodical exams during the last session ? 533. 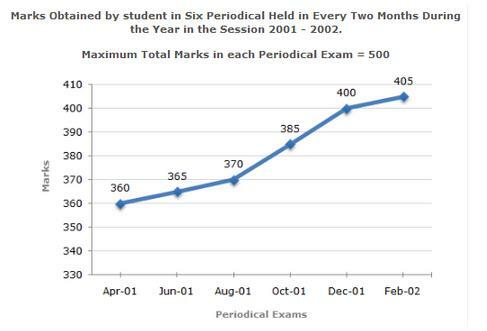 In which periodical exams there is a fall in percentage of marks as compared to the previous periodical exams ?